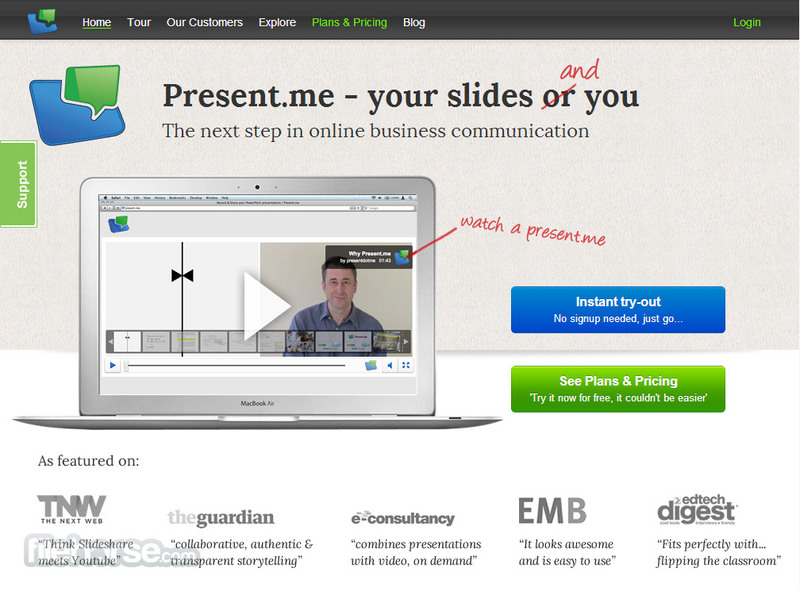 Present.me is an innovative business presentation sevice that enables you to showcase your slides to customers, business partners, co-workers, visitors, or friends in truly interactive way that will surely benefit everyone. In addition of showcasing your slideshow presentation, Present.me gives you the opportunity to directly explain the meaning of those slides with video feed. This enables you to personally and with your own words explain all the points of your presentation, talk details about plans, and show your enthusiasm that can never truly be infused into old and boring textual presentation slides that we are all used to make. This great combination of traditional presentation with video is available to you in several pricing plans, from free to truly professional grade subscription that covers every possible usage scenarios – from quick personal presentation to your friends that can connect to you via Facebook, twitter and other social networks, larger education gatherings, small business planning to full scale yearlong plan with unlimited sessions and extremely powerful security measures that can be used by large companies. With the power of cloud computing, Present.me offers incredible flexibility, security, portability and most importantly a totally new way of showcasing your plans, projects and presentations. Give it a try! Brand new kind of manager that enhances traditional presentations! If you are certain that you basic presentations made with old programs are not managing to capture attention of your audience, then you are in trouble. But, that’s not the end of the world, especially if you know about Present.me, a unique presentation hosting website that manages to infuse life into traditional presentations by adding to them another layer of your own presentational skills. Present.me is a very unique and appealing online service that allows users from all four corners of the world who are not satisfied with the current state of their traditional slideshow presentation created in any modern program (PowerPoint, Google Docs and others). With this app, anyone can easily upload that presentation to online storage and then create visual or audio commentary using your own webcam or microphone, giving new life to your presentation and enabling you to create effective presentation, slide show, webinar, tutorial or learning lesson where you yourself can prove points that you want to present to audience. By offering this additional commentary track that can be audio or audio with video, you can craft a online-hosted presentation that anyone can access with ease (friends, family, school friends, teachers, workers, business partners, freelancers, team members, random internet viewers…) and offer them easy way to watch your presentation directly from their internet browsers without installing any plugin or add-on.And don’t worry about your original presentation files, because they will be archived and offered for download by anyone who visits your Present.me page. In addition to seamless presentation, pages that are hosting your content are also responsible to give you better insight into the way your audience is responding to your content. There, anyone can access modules for comments, likes, Ratings, sharing and more, while content owners can see those stats and easily see how their presentations are accepted by the public. 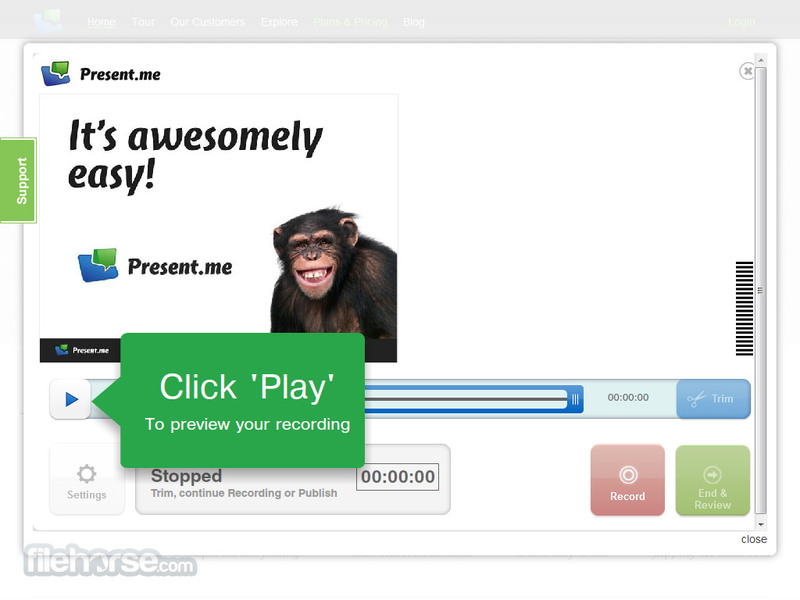 Interface of Present.me is as expected, very easy to use, and suitable for users of all technical levels. Main dashboard of the app allows users to simply upload their presentations,prepare themselves for recording session and then simply use their microphone or webcam to create appropriate commentary track in which you can use your body language, natural speak and control over slides to prove your point and provide descriptions of your data and concepts. Listing of projects or public galleries are easily controlled, which is also true for sharing and embedding tools. Present.me can be used for free, but that plan is limited to 3 presentation recordings per month and you can only publish public presentations. These limitations can be removed with “Regular” ($59/year) and “Plus” ($159/year) account types, who also enable password protection, better video management support, lead generation, analytics and document attachments. 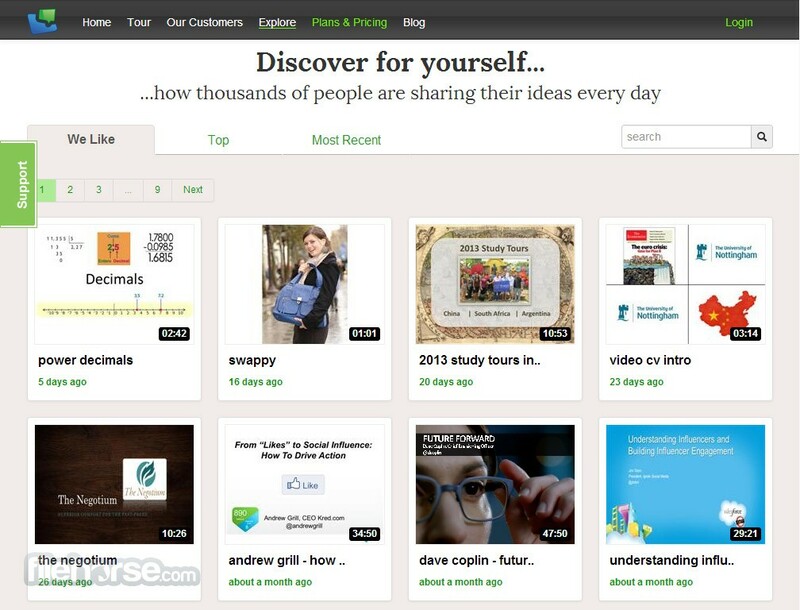 Even though it was created quite recently in 2011, Present.me immediately managed to attract very large following that mostly comes from the incredibly large install base of PowerPoint users, which is by some measurement as large as 500 million users who give over 30 million presentation in each of their working days. You have heard it all before, but what does it actually mean? In simple terms it means you don’t ever have to install anything on your computer. All you need is a web browser and an internet connection. There’s no upfront cost, you only pay for what you use and you can access your information from anywhere. Whether it’s Powerpoint, PDF, Excel, Word, Google Docs or Open Office, with the click of a button you can upload your files to Present.me they will be converted to a format so they’re ready to record. Just present into your webcam clicking through your slides as you go. It’s as easy as presenting in person. Once you’re finished, just press ‘publish’ and you’re ready to share. Whether it’s on Facebook, Linked In, Twitter, by email or embedded in your blog - it’s only a click away. With paid accounts, you can choose to share with the whole world, a select few or keep it to yourself - it’s entirely up to you! The stress is taken out from the recording. If you make a mistake just rewind a bit and go again. At the end, all the good bits will be joined together and your audience will be none the wiser. No cutting & pasting or dragging and dropping ever again! Present.me isn't just for the desktop - you can watch your presentations on the move too! You can view them on your iPad, just using your browser and without installing any extra software. With Present.me you can upload just your slides, add audio, add video, or just upload a video all with the same account, and all from the same place. 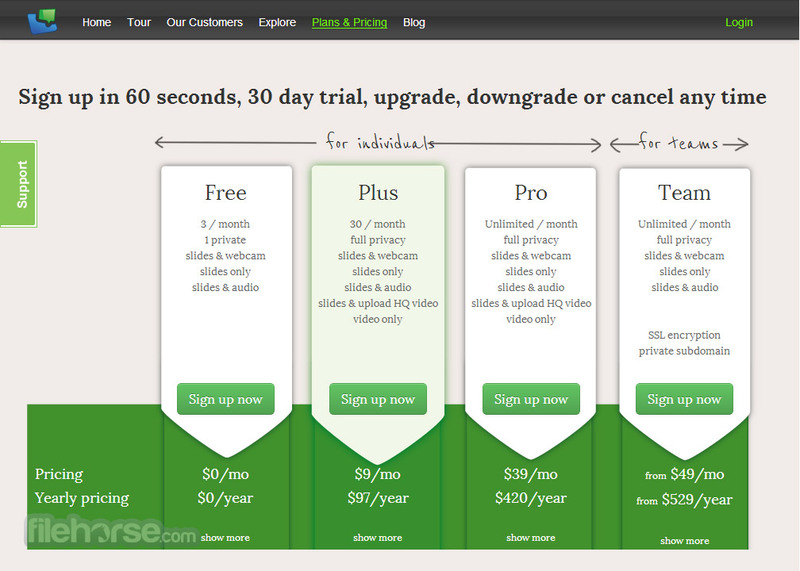 No need to send your customers to four different places or pay four subscriptions – it's all there on Present.me. Sign up for Team account, and you will get a private subdomain (https://yourco.present.me) where all your company can share their content in a secure and private way. Because your content is in the cloud, amazing analytics can monitor and determine who is watching your content, what they're watching, where they are watching from and for how long.